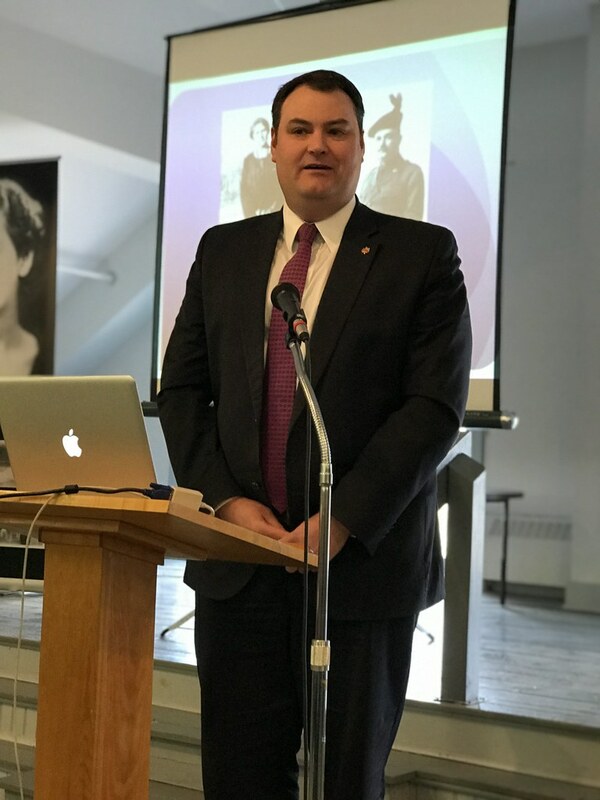 This week we are traveling to Middleton, Nova Scotia where I attended the Heritage Day celebrations for Mona Louise Parsons, the 2018 honouree. Welcome to week 361 (3/1/2018) of Travel Photo Thursday. Come along as I introduce you to this amazing woman whom many have never heard of, and until a few weeks ago I counted myself among that group. The Heritage Day festivities took place in the town’s museum, which for most of the 20 century had been the town’s school. Many old schools get torn down these days, so it’s nice to see this particular one being repurposed. The reception was standing room only in the museum’s 3rd Floor multi-purpose room. 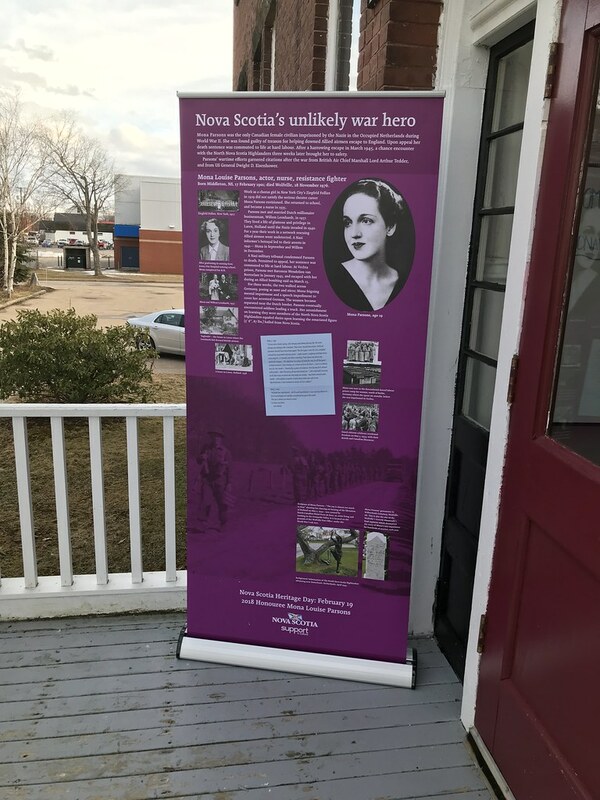 We were all there to learn more about Mona Louise Parsons, the Nova Scotia woman who ended up as a resistance fighter in Nazi Europe. She received citations from both the British and American governments for her involvement in the resistance movement, but not the Canadian government. I got lucky and ended up sitting in a reserved seat at the very front. I have no idea why! First came the dignitaries: our minister of culture and heritage, our Member of Parliament for the area, and then the Mayor of Middleton. The only person missing was the Premier, who’s not overly popular these days. And finally, historian Andria Hill-Lehr, the person we all came to see. 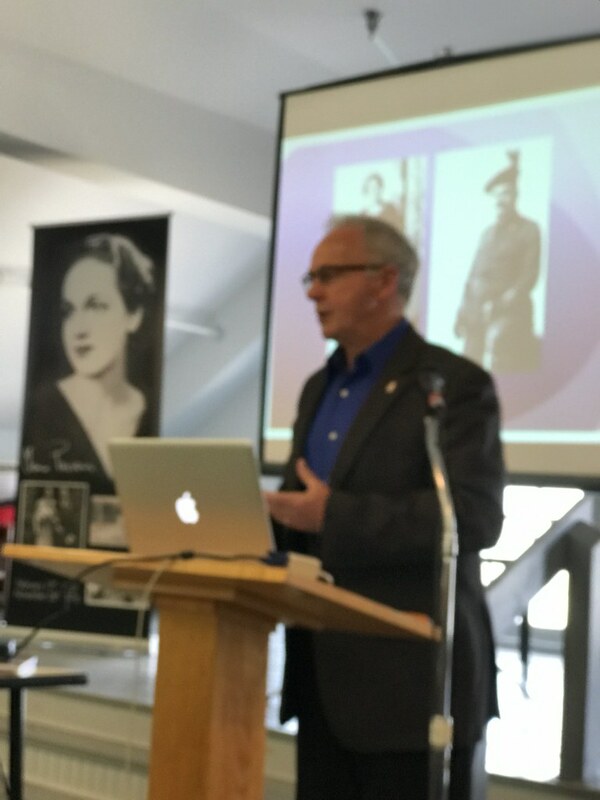 Andria is an amazing storyteller, and author of Mona Parsons biography; MONA PARSONS: From Privilege to Prison, from Nova Scotia to Nazi Europe. The back cover of the book reads (and I quote). “Even as a young girl growing up in Nova Scotia, Mona Louise Parsons stood out for her elegance and theatrical flair. But the life of this Middleton-born, Wolfville-raised woman has always overshadowed her stage roles. From a Nova Scotia childhood, she became a 1920s New York chorus girl, a Depression-era nurse, a prisoner of the Nazis, and an escaped emaciated fugitive who walked across Nazi Germany in the dying months of World War ll. I did purchase a copy of Andria’s book and it’s an amazing read, and highly recommend the book to anyone who is interested in learning more about this amazing woman. I am going to share with you some of her life as told by Andria at the Heritage Day reception. 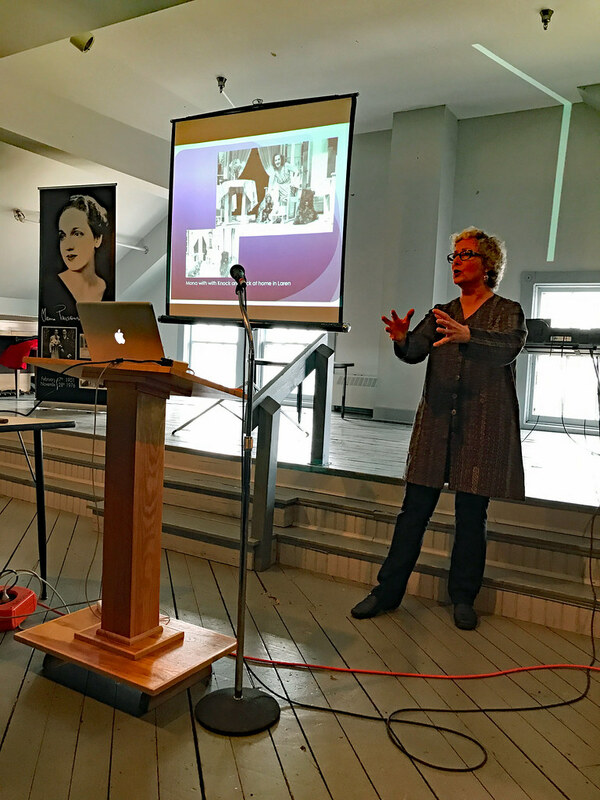 Mona Louise Parsons was born in Middleton and moved “down the road” to Wolfville when her father’s business burned to the ground. He re-established himself in Wolfville and that’s where Mona was educated. Once her education was complete she left Nova Scotia for the bright lights of New York. She actually danced in the chorus line of the Ziegfeld Follies. From there it was on to nursing school. She may have decided that the theatre was not a good long-term career choice. It was Mona’s brother Ross who introduced Mona to her future husband, millionaire Willem Leonhardt. The couple married at his parent’s home in Holland. (From the book) “In much the same tradition that a woman about to marry into the British Royal Family resides in one of the palaces in the weeks prior to the wedding, Mona’s first home was that of her future in-law: Schoonond, in s’Graveland”. It seems married life was easy and enjoyable until the war. Then, Mona and Willem became involved in the resistance movement. Eventually, they were caught by the Gestapo and thrown into prison Both of them did survive and were reunited after the war, but Willem was never the same again. After his passing, Mona found her way back to Wolfville. She married a childhood friend and lived there until she passed in 1976. I’m not sure how many people she and her husband saved through their involvement with the resistance movement, but I think the number would have been significant. Finding her way back to Canada is also an amazing part of the story. Mona was locked up in a women’s prison and there was a male prison close-by. The end of the war was looming and the Germans bombed the men’s prison. The warden of the women’s prison opened the gates and told the women to run. Mona and a prison friend (they had been planning an escape) walked for two weeks before they came upon a Canadian army regiment, not only Canadian but from Nova Scotia (the North Nova Scotia Highlanders). The men were suspicious and did not know whether to believe Mona’s story or not. Once again she was blessed with unbelievable good fortune. One of the men in the battalion was from Wolfville and he recognized her as being one of his father’s patients! There is so much more to this story than I can convey in this post. If you’re interested to learn the entire story, be sure to get yourself a copy of Andria Hill-Lehr’s book, Mona Parsons: From Privilege to Prison, from Nova Scotia to Nazi Europe. You won’t be disappointed! If you’re ever in Wolfville visit the Post Office, to enjoy a sculpture celebrating Mona dancing with joy after her ordeal ended. You can also stand in front of Seminary House at Acadia University, where she was educated. (On a side note, I lived in Seminary House one semester way back in 1973). You can head to the duck pond at Willow Park where she often skated gracefully across the pond. This copy of the “Dancing for Joy” sculpture can be found in the Middleton Library. 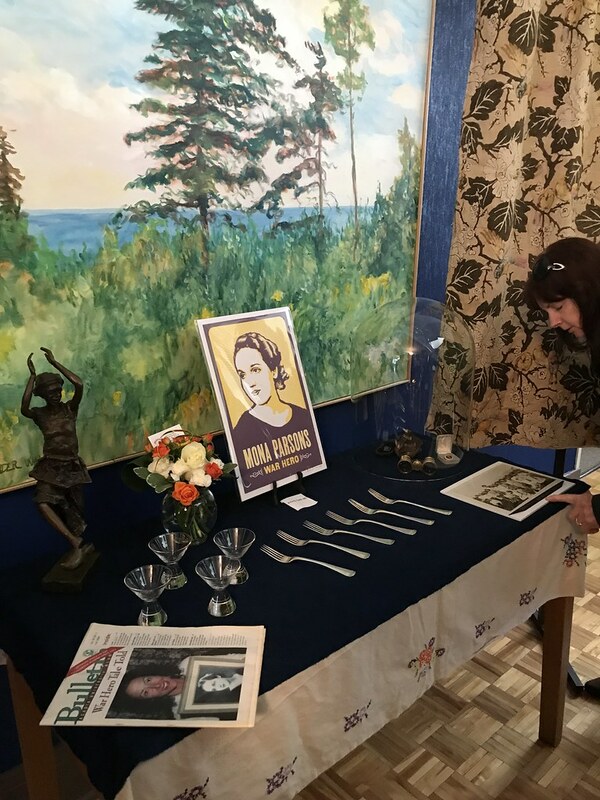 There is also a small collection of memorabilia which once belonged to Mona Parsons. 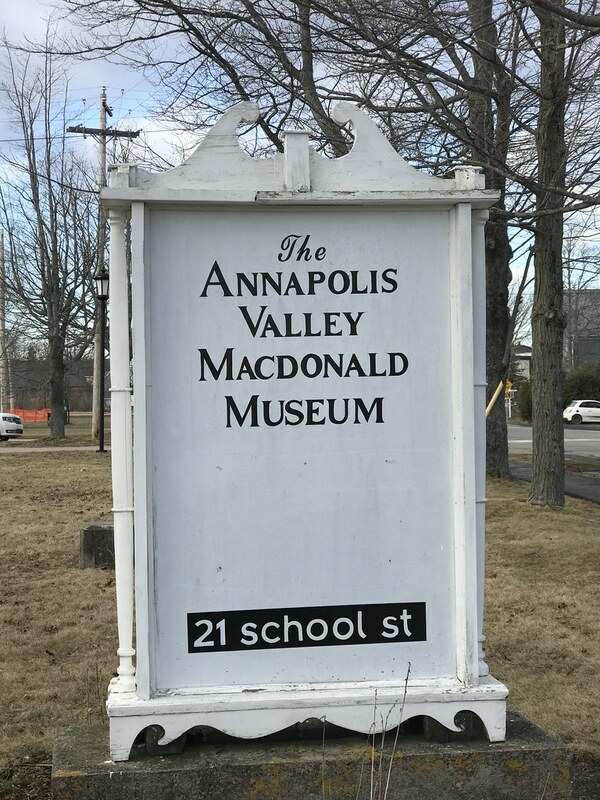 The Annapolis Valley McDonald Museum is open April 1st to December 16th, Check their website for opening hours, or call 1-902-825-6116. If you’re driving from Halifax, take highway 101 to exit 18, approximately 135km. 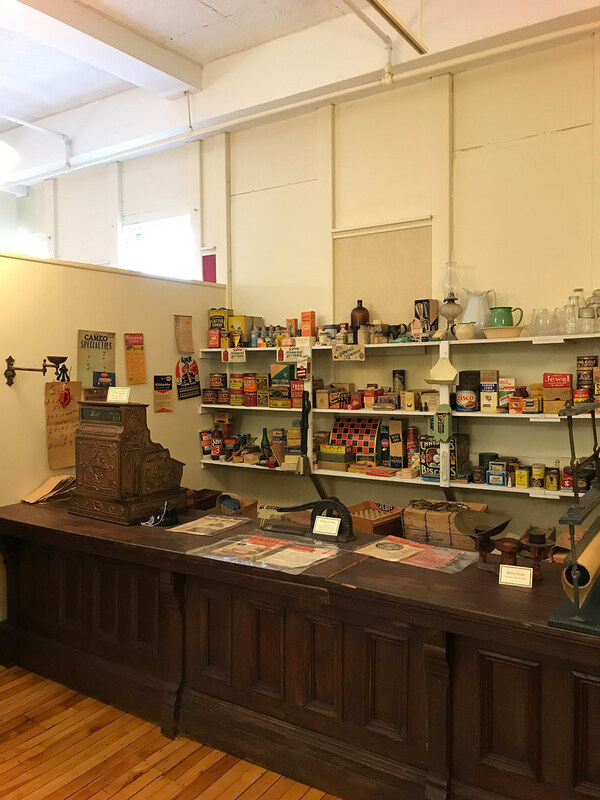 You’ll find an excellent collection of antique clocks and watches, a genealogical research library, a local sports hall of theme, and much more. Genealogical libraries seem to be popular in Nova Scotia. 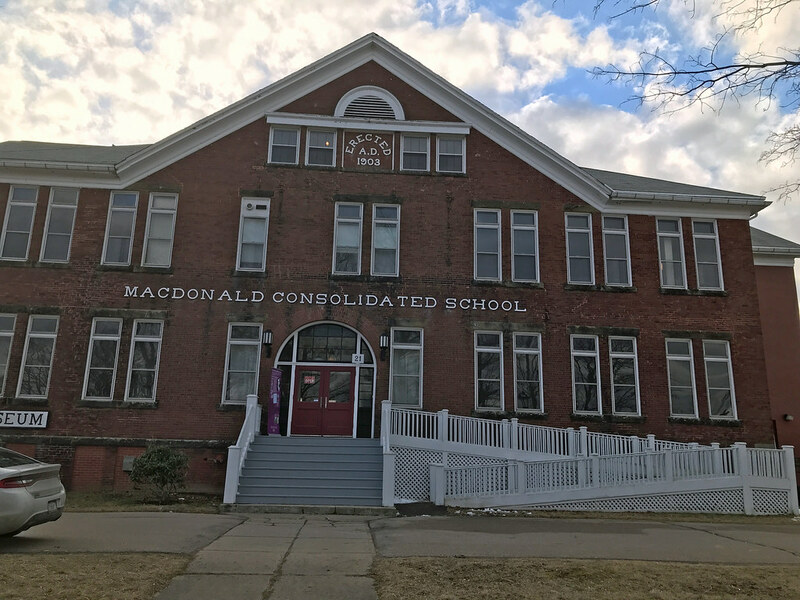 I wrote about the one in Pictou earlier this year. For me, travel and history go hand-in-hand and it’s always interesting (even thrilling) to be introduced to a local hero. How about you? Let us know in the comments? I also love travel and history and I love reading about brave women. A true hero! Thanks for sharing – I’m happy I could learn this story. What an interesting and inspirational person. Going to have to get the book to read more. Amazing is a good word to describe the woman, the research and your afternoon. Loved this post, Nancie! I love reading about inspiring people. What a life to have lived. Such a pity her husband was changed after his captivity. Totally understandable though. She must have been a very resilient person. I love hearing and reading about women like Mona Louise Parsons who walked a path so completely different from her contemporaries. She sounds like an extraordinary and brave woman!